Colombia’s cyclists have been gaining worldwide recognition in recent years – making the country a destination spot for all avid roadsters. This is an up and coming tourism spot and if you like that level of excitement, there is no better time to visit Colombia then now. Join a small group and visit the coffee zone in the heart of the country. This cycling route takes you to the western slopes of the central Andes. 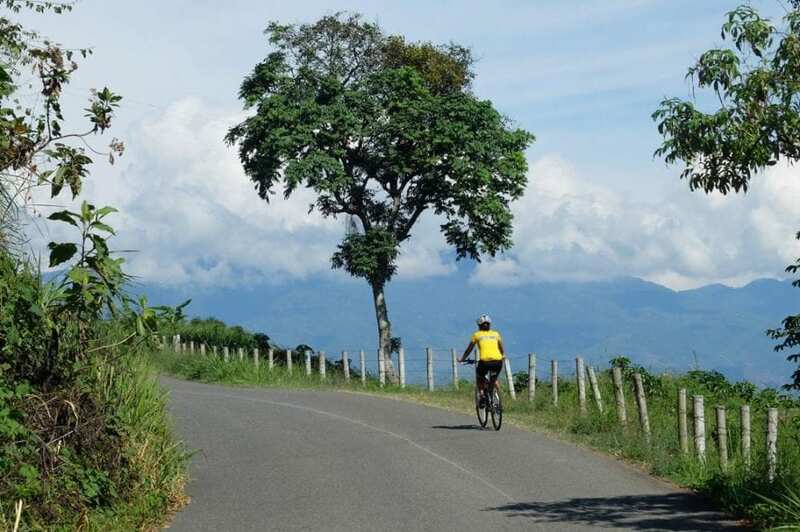 Bike along paved and winding roads populated with coffee plantations and quaint towns. The average cycling distance each day is 54 kilometres with ten full days of biking. The operators will provide you with a cycle computer to record your personal daily distance.The roads are in good condition and generally free of heavy traffic outside of larger cities. This is a challenging cycle and previous bike experience will be helpful to you. You’ll be visiting some remote areas where the locals don’t see many tourists – so expect an immersive experience. Enjoy Pueblo Tapao, Cartago, Calarca, Rio Verde, Boquia, and more. Don’t fret the effort involved in cycling the Andes, the remarkable views will be their own reward. Acclimatise in Bogota whilst joining the city residents in their weekly traffic-free day of urban cycling! Land only passengers can arrive at the hotel in Bogota this afternoon/evening. *Standard Hotel*. Passengers on our Avianca group flight will have flown overnight and arrive today in the early hours of the morning. There will be time for a few hours rest and breakfast before setting out with the tour leader in order to try out your bike and cycle the car-free streets of Bogota as part of the weekly 'ciclovia' event. Every Sunday large parts of the city are closed to traffic as residents cycle, jog, walk, roller-skate in a remarkable display of utilising public space in the interest of leisure and togetherness. You'll have a chance to see the modern Bogota and also visit a market in the bohemian neighborhood of Usaquen. This immediate exercise is a great way to minimise the effects of jetlag! At a certain point after a couple of hours in the ciclovia, the leaders will give the option of climbing 'Los Patios'. This is an optional ascent that is practiced by hundreds of Colombians. It is approx a 7km climb at an ascent of 6% for most of the route. If you are nervous about the rides later in the itinerary then completing this challenge is a great confidence boost. Note that the road used is not closed to traffic so you should be happy cycling on a busy road, and of course afterwards you have a fun downhill ride with spectacular views of the city. You will have the afternoon at leisure and we strongly recommend visiting one of the fantastic museums the city has to offer, which all offer free entrance on Sundays. *Standard Hotel*. In the morning we will visit the famous and unique Zipaquira Salt Cathedral, located inside a commercial salt mine. After the visit we will be driven to Bogota airport to catch a flight travelling southwest to Cali. From here we will be driven a short distance (approx. 1 hour 15 minutes) to the town of Buga where we stay and prepare for the point-to-point riding that will commence the following morning. *Standard Hotel*. Buga is one of the oldest settlements in the region and an important religious place for the country as pilgrims flock to visit the Basilica which contains an image of Christ. Buga is surrounded by sugar cane fields and is located in close vicinity of the Cauca River. The tour starts out travelling in a northward direction, staying parallel to the Cauca River as we pass fields of sugar cane and fruit trees. Along the route we will stop to visit a sugar cane farm. The vast majority of today's road is fairly flat or with small undulations, and the route is very scenic thanks to the proximity of the Andean Western Cordillera and the possibility to see peaks of the Central Cordillera on a clear day. The temperature in the valley can get very high so be sure to wear sun cream and stay hydrated. Our destination is the town of Roldanillo and we will spend the night at a hotel just off the main plaza. (Ascent: 515m, descent: 530m). *Standard Hotel*. Another day of cycling on a predominantly flat and quiet road which will take us through beautiful landscapes in preparation for the more mountainous rides in the days to come. We'll stop for some grape juice along the way and continue to the hotel on the outskirts of a small town called Cartago for a refreshing dip in the swimming pool! (Ascent: 381m, descent: 394m). *Standard Hotel*. The first few kilometres of today's ride are along a flat road leading to an intersection from where we'll take an undulating road south-eastwards to Alcalá and up into coffee plantation region. This section will involve the first real climb of the tour. After passing Alcalá we’ll have lunch in a village called Quimbaya and continue through Montenegro. We’ll arrive at the hotel and have the afternoon free to rest and enjoy the swimming pool and surroundings. In addition to coffee plantations, the landscape is also home to banana and plantain, bamboo trees and flowers. A short walk down the road from the hotel there is a coffee theme park with a viewing platform at the entrance which is definitely worth a visit. (Ascent: 890m, descent: 530m). *Standard Hotel*. Today we start riding on a quiet and fairly flat road surrounded by coffee, banana and pineapple plantations to the town of La Tebaida. After passing this town, we’ll stop for a drink break and ride for a short section on a busier road. At a point called 'La Y' we will deviate and take a secondary road to enjoy a nice downhill to Rio Verde and then continue onwards to the town of Buenavista. From Rio Verde there is a challenging steep uphill of about 3km to get to Buenavista - this is the hardest climb of the tour but very rewarding. We'll visit a local school before having lunch in the town of Buenavista, and then there will be an opportunity to try one of the region's best exported coffee brands at a wonderful terrace with a beautiful view. After the break, there is still some climbing to be done but after reaching the the top it will all be downhill back to Rio Verde on a different road. From Rio Verde, you will take the same road previously ridden to the hotel for the night. (Ascent: 1000m, descent: 1147m). *Standard Hotel*. Today’s ride is 90% uphill! But don’t worry as it is not too steep. There is a steady climb after crossing the river all the way up to Boquia (near Salento). On the way we’ll stop for a Coffee Experience Tour at Café Sorrento and have a chance to learn about the process of growing coffee. After this tour the next stop will be at the Quindío Botanic Gardens where we will learn about the local flora and we also visit a butterfly farm. Lunch will be in the town of Calarca and then we’ll ride the last portion of the route involving a very scenic final downhill to Boquia. The finca for the next two nights is beautifully situated and is a peaceful place for us to be based. After dinner some kids from the area will give a folklore performance. It's also a good opportunity to enjoy a beer. (Ascent: 591m, descent: 282m). *Finca*. You may wish to rest today and take a well-earned break from the saddle, remaining in the surroundings of our beautifully located ranch just outside of Salento. Alternatively you can opt for a wonderful walk in Cocora Valley to see the picturesque endemic Wax Palm trees. There are different walk options varying in difficulty and duration (approx. 11km), all of which are signposted. For those who want to cycle up to the highest point that we’ll meet on the tour (2410m above sea level), the ride from the accommodation and up to Cocora involves a 1000m climb. (Ascent: 1000m, descent: 1000m). *Finca*. Today we tackle an initially tough climb out of Boquia and the valley up to join the main road to take us towards the pretty coffee town of Filandia. It is claimed that because of its architecture, landscapes and hospitable nature of the locals, that Filandia is one of the most charming and attractive towns in the whole of Colombia. We’ll take a break here before setting off on a beautiful stretch of road down to Quimbaya and onwards to Alcala for lunch. This stretch from Filandia to Quimbaya is one of the tour highlights. In the afternoon we continue in the direction of Pereira and take a left turn before the city in order to reach Cerritos, our location for the night. (Ascent: 1220m, descent: 1830m). *Standard Hotel*. Our penultimate day of cycling has it all. We start off gently with a fun downhill section leading to the Cauca River from where our route plateaus out as we are flanked on both sides by sugar cane fields. After lunch at a roadside restaurant with an adjoining trout farm, we follow a branch of the river northwards (Rio Risaralda). As the road becomes steeper and offers up spectacular views on our final climb into the highland town of Anserma. The town’s location on the edge of a mountain makes it completely different from other places seen on the tour, and several of the streets are too steep to be cycled so it lends itself to being explored on foot in order to get the maximum enjoyment! We will have dinner at a local restaurant and there are a couple of nearby bars to explore afterwards. (Ascent: 955m, descent: 375m). *Standard Hotel*. Our last day of cycling is another stunning ride as we navigate some hilly sections on our way to Risaralda. From here we face a delightful downhill to cross the Cauca River once more and stop for refreshments in nearby La Rochela. After La Rochela we will ride to the place where we have lunch. We will have to tackle a few more climbs to reach Finca La Romelia, where we will stop for lunch. After lunch you will be transfered to your hotel where you will spend the last night in Colombia. (Ascent: 874m, descent: 1481m). *Standard Hotel*. After breakfast we will transfer by private bus to Pereira airport where the tour will end and we'll fly back to Bogota in order to connect with international departure flights. Those who have booked the Cartagena trip extension will fly via Bogota up to the Carribean Coast.If there is a long wait at Bogota airport between arriving from Pereira and departing in the evening, it is possible for the tour leader to organise additional services for you should you wish. They will be able to organise this locally for a small charge.